As many readers will know, this blog came about when I started my post-graduate studies at university focusing on 3D printing. My knowledge allowed me to get into lecturing, and part of this role has allowed me to run workshops for the community, including school teachers, secondary students, and the broader public. It turns out these experiences have taught me a thing or two about running 3D printing workshops in short time-frames, often with people who have never seen a 3D printer in action, and has lead to me publishing a chapter in a book detailing how I organise a one-day 3D printing workshop. 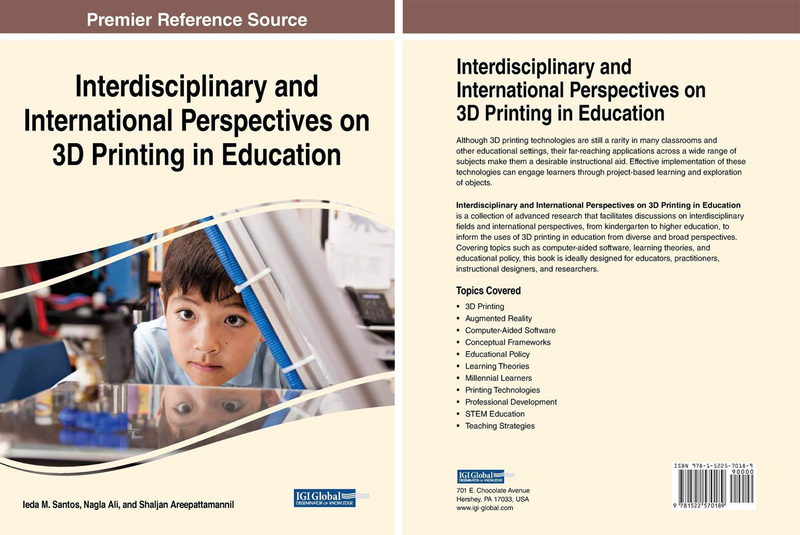 The book is called Interdisciplinary and International Perspectives on 3D Printing in Education, and includes 14 chapters from leaders around the world on the topic of 3D printing in education. My particular chapter is called Re-Educating the Educators: Collaborative 3D Printing Education, and calls attention to some of the many real challenges that plague teachers who are attempting to adopt 3D printing in the classroom. The chapter starts with a summary of how Australian schools are adopting the technology, and moves on to new research and peer-reviewed literature about how short, intensive courses are helpful in offering teachers meaningful training in regards to 3D printing. The later section of the chapter provides the organisational structure and hands-on activities I use in my workshops, and is hopefully useful to many other people who are running training programs for teachers and others interested in 3D printing. A big thank you to Sarah Saunders at 3dprint.com for writing a great article about my research which you can read here. The article provides a nice summary of the book which I hope will help it reach a wide audience, as there is not enough material available for teachers, curriculum planners and education researchers wrestling to bring 3D printing and other technologies into the classroom. This book at least goes some way to presenting the latest research ideas and data to fill this gap.